Weiner Dog Lovers Unite! 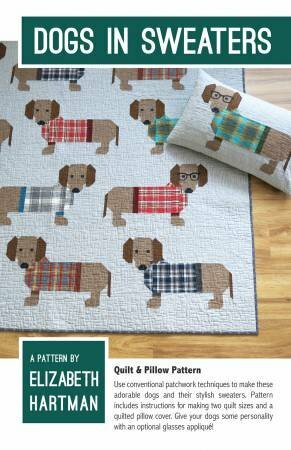 Dogs in Sweaters includes instructions for making quilts in two different sizes and a delightful 16” x 26” pillow cover. These adorable dogs and their stylish sweaters are made using conventional patchwork techniques. Give your blocks even more personality with an optional glasses applique for that fun "hipster" look. This pattern is absolutely perfect for personalizing for pet lovers! Two Quilt Sizes: 45" x 60"